You may wonder whether to test your tap water for impurities. Wouldn’t $150 be a reasonable price to learn whether your tap water is causing health problems? WILL TESTING REVEAL IF YOUR WATER IS MAKING YOU SICK? No matter what the results, the pipe or water tests will fail to answer that excellent question. Say the test shows that your water contains an unexpected entity, whether chemical, parasite, bacterium, heavy metal, or pharmaceutical. That will not prove in any way that the entity is causing any illness you might be experiencing. What worries me is that water tests are almost guaranteed to produce what in medical parlance is called a “false negative.” That is, a test is likely to tell you your water contains no dangers, when indeed it does. It’s not because the test is defective. It’s simpler than that: a water test cannot check for everything that could possibly be in the water. That would be an infinite number of chemicals. I’m not saying that there are an endless number of toxins in your water. As a poet, a politician, and several philosophers have pointed out, we can’t know what we don’t know. We can only test water for dangers we already recognize as dangers. So you could test and receive a clean bill of water health, while untested-for dangers await you in your municipal water. Choosing what to test for becomes even harder when you realize that what chemicals are in municipal water changes with the seasons. More on that in a moment. Let’s say that the test reveals problems with your tap water. And let’s say your unusually agreeable landlord immediately replaces all the pipes in the house. OK, but the pipes in the street or even further upstream might still be a problem. Aside: You might think that federal standards exist regarding what materials water pipes can be made of. I certain assumed that. I was wrong. WHAT’S IN YOUR WATER IS TRYING TO KILL YOU? Even if all the pipes between your house and the water treatment plant are perfectly safe, the treated water itself likely contains questionable chemicals. Thank your municipal water treatment plant, which is trying to keep you from dying from whatever toxic algae, bacteria, protozoan, or fungus happens to be growing in your local water reservoir that month. Those creatures would be perfectly happy to live in your body. Algae is that green slime that grows in standing water. Some algal varieties can produce toxins linked to brain disorders such as dementia, amytrophic lateral sclerosis, and Parkinson’s disease. But treating a water supply suffering from an algal bloom at present requires adding chemicals of questionable safety to what will become drinking water. SO CARCINOGENS ARE PLACED IN YOUR DRINKING WATER. It can make sense. Sort of. For instance, copper, which can promote growth of cancer, is sometimes added to municipal water to deal with toxic algal overgrowth in reservoirs. Yes, both plague and remedy are toxic. The EPA is working to find better ways to mitigate the effect of toxic algal blooms in drinking water. But if depending on the government’s repair schedule leaves you cold, there’s good news. You can clean up your drinking water yourself. By sunset. BOTTLED WATER COULD KILL YOUR BUDGET AND BURY US ALL UNDER THE EMPTIES. Let’s dispense quickly with the idea of bottled water. The EPA says bottled water is no safer than tap water. In fact, some of the most famous brands (such as PepsiCo’s Aquafina and Coca-Cola’s Dasani) have been forced to publicly admit they are just tap water. True, the tap water is filtered and some minerals are added. For that, the price is hiked. A lot. By some estimates, a hard-to-swallow 2000 times. (I’m a mediocre typist, but no, that’s not an extra zero.) And the damage doesn’t end there. The emptied bottles pile up, problematic for the environment. I am partial to distilling water at home, using a countertop distiller. However, reverse osmosis system fans will argue that their system is best. Yes, reverse osmosis produces damn clean water. But to me, reverse osmosis systems are futzy. They have to be installed at the household water intake, kitchen, or both. And it takes some work to maintain them. But they are reliable and available. Pitcher-filtering is a choice some make, mainly because the cost can be less than $50. And certainly, pitcher-filtered water is cleaner than unfiltered tap water. But pitcher-filtered water can’t remove as many impurities as a distiller or reverse osmosis system. Carbon-based point-of-use filters claim to remove more impurities than pitcher filters. They have to be installed at the sink and replaced regularly. You can pick one up at a local hardware store. Distillation is my go-to water purification method, because it removes more impurities from your tap water than any other method. A distiller boils your tap water, turning it to steam. Steam is pure H2O. Anything that is not H2O has been left behind in the boiling drum. 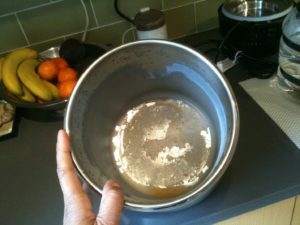 Seeing the sludge left in the bottom of the drum after my first distillation impressed me, in a nauseating sort of way. Had I been filtering such smelly crud through my kidneys? You may run across an argument that distilled water is unhealthy or “unnatural,” because the minerals have been removed. I am not about to get into the natural vs unnatural debate. I’ll just say that I agree. Minerals are fantastic. We need them desperately. It would be ideal, perhaps, to get minerals from drinking pristine Himalayan glacial runoff. With much municipal water coming from reservoirs replenished with acid rain, or sourced downstream from pig farms and nuclear power plants, I prefer to get my minerals from organically-grown produce and meat. Aside: You can overdose on a mineral. That turns it into a toxin. Having your own doctor test your mineral status is a wise way to decide what mineral supplements, if any, to add to your routine. Distilled water is not just for drinking. Use it for all your cooking, including steaming, to further reduce unwanted exposure to pollutants. Showering exposes you to more pollutants than does drinking water from a glass. This is because during a normal shower, chemicals vaporized from the shower water enter your bloodstream directly through the lungs. Screw-on carbon-based showerhead filters can help. They are easy to find and install. Distill your water if you can. Or if you’re a believer in reverse osmosis, go for it. But even a simple pitcher filter is better than drinking out of the tap. And you may want to explore other ways of purifying your tap water. As for testing tap water, if you have the means and curiosity, go ahead. The Natural Resources Defense Council recommends that if you suspect your water is polluted that you engage testing. But do think about this: a glowing water test result can’t guarantee your water’s purity. So consider investing that money instead on any water purification process you can afford. This is the distiller I use. It came ready to go out of the box. I chose it because it has a stainless steel drum and a glass collecting carafe (rather than plastic). It also runs the distillate through a charcoal filter. I have to clean it once in a while with citric acid and replace the charcoal filter. I bought it in 2011 and have used it daily since. It still works perfectly. Previous Previous post: Is your sleeping pill killing you?